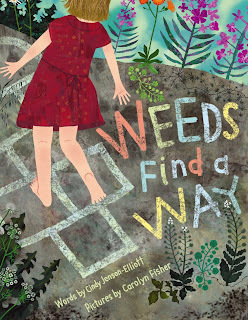 Jenson-Elliot has penned a lovely informational picture book about how weeds disperse their seeds. The sparse text is packed with lots of facts about these mighty plants that are able to live in places other plants cannot. We find them in sidewalk cracks, fields, tiny crevices, and, as in my yard, always in the vegetable garden. Their roots reach deep, making them nearly impossible to eradicate. 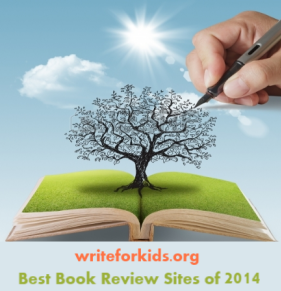 Complementing the well-written text are colorful illustrations by Carolyn Fisher. Done in mixed media and digital collage, they offer lots of details about each plant, making identification doable. Back mater includes a brief explanation about the weeds, such as the fact that some are native to areas while others are invasion. A plant guide with brief descriptions of weeds shown in the books. A small illustration accompanies each entry. A lovely addition to library collections. Use it in flower or fall themed story times or with classes studying about nature. Visit the author's site for a curriculum guide and to watch the book trailer. Thanks for reviewing Weeds Find a Way! 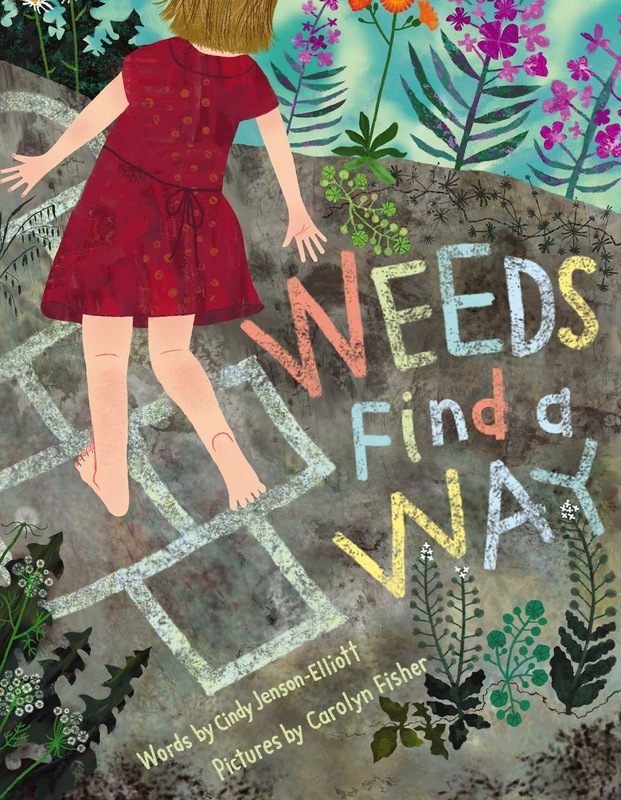 I'm sure you can find plenty of weeds in your wonderful Maine woods, so I hope teachers will use it in their classrooms. I went to Bowdoin and spent many happy fall days tramping in the woods and biking to the coast. Cindy: We hope you come visit Maine again sometime. Right now is the perfect time to watch the weeds spread their seeds. Thanks for writing this simple science book for young children.